This is the first installment in a four-part series written by Jonathan Matthew Smucker in collaboration with Madeline Gardner, originally published in 2007. They won’t do it. It’s up to all of us to stop the war. While a large majority of Americans want their leadership to bring the troops home, Democrats are using their new majority to state their heartfelt wish for the same-to pass a symbolic resolution-rather than to use actual power to make it so. New House Speaker Nancy Pelosi and most other Democratic representatives are parroting Bush by equating continued funding for the war with support for our troops. They should be refuting this manipulative frame, not reinforcing it. Many rank and file Democrats and some progressive leaders like Representatives Jim McGovern (MA) and Dennis Kucinich (OH) are pushing to end the war by cutting off the Administration’s requested funds. But it is becoming clear that the November election results – popularly dubbed a referendum on the war – are not enough for the new Democratic majority Congress to decisively exercise their power to end the war. It is becoming clear that the majority of Americans who favor a quick withdrawal will have to exercise their own power – beyond voting – to pressure an end to the war. The politicians won’t do it without the mounting pressure of a well-organized popular movement. It is up to all of us to build such a movement. It is not enough to be right or to have the truth on our side. We need the damn steering wheel! From the start – or rather before the start – the antiwar movement has been correct on just about everything about Iraq. All of its warnings have most tragically come true. Has this translated into popular prestige for the antiwar movement? Has it increased the movement’s power or influence? Has it dramatically bolstered our ranks? Has it forced capitulation to any of our demands? For the most part the answer to these questions is no. To put it plainly, having the truth on our side has done jack for us. It’s time for us to scrap the motto “Speak truth to power.” What has speaking truth to power gained us other than a clear conscience? Having the truth on our side allows us to wash our hands of Bush’s bloody misadventure, but what else does it actually accomplish? Power responds to power, not truth .. perhaps especially the current Administration. Yes, we need to both seek and speak truth, but truth is not presently our primary problem. Public opinion isn’t even our problem anymore. Popular sentiment against the Iraq War has reached a record high. Pundits from across the political spectrum tell us that the midterm elections were a referendum on the war. But beyond the vote, where is popular mobilization against the war? While many dedicated individuals and groups continue antiwar efforts, still, the movement is remarkably weak considering how firmly the public now opposes the war. It is not enough that the neo-cons’ still-unfolding failures have shifted majority opinion into alignment with the antiwar movement’s position on withdrawal. It is people’s active participation, not their passive agreement, that is needed. To end this war .. and to prevent future ones .. we need a mass movement. Mass means millions. We cannot afford to sit idly waiting for the new Congress to deliver on a symbolic and undefined referendum. Nor can we afford to do antiwar activism as if we might somehow, someday stop the war without first activating a mass base. Truth, unfortunately, is not its own arbiter. The neo-con cabal determining our country’s foreign policy is not swayed by appeals to reason, values or truth. Our problem is not truth, but power. They have it. We don’t. Yet. Another perhaps more hopeful way of putting it: their power is kinetic, already in motion. Ours is still largely potential, in need of activation. The task of antiwar change agents is to organize and activate a base strong enough to enact a vision of justice and peace. If we are to end the war, and prevent future wars of aggression, we have to turn popular antiwar sentiment into an active, potent and coordinated political force. We can’t think of ourselves as the lone prophet crying in the wilderness, as the righteous few making our stand, as the impotent conscience of a nation gone mad. We need to focus our attention outwardly, to mobilize the large constituencies that are now more approachable than before. 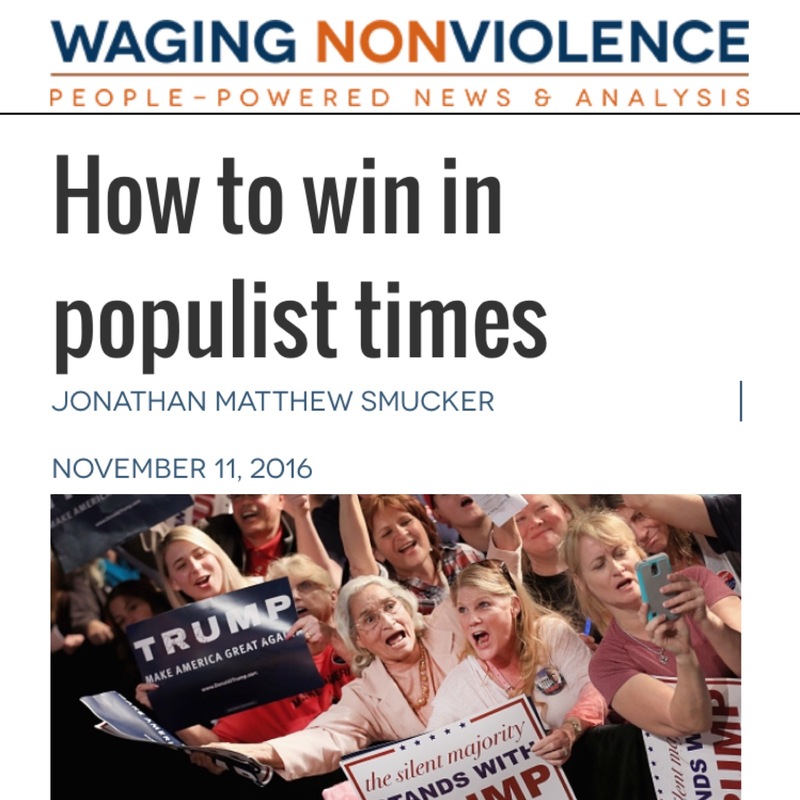 We need to figure out the most appropriate and strategic role the present antiwar movement can play in building a popular movement many times as big. Local antiwar organizers presently lack a common overarching conceptual framework to unite their efforts to grow such a movement. This series proposes that the present antiwar movement conceptualize three primary roles for itself, from which all its various tasks and tactics stem. These roles are 1) interpretive, 2) instructive, and 3) facilitative. But first, what is an antiwar core? Presently it is the people who are already active in antiwar efforts on an ongoing basis, but it will shift and expand as the movement grows. Core, in this case, should not be an exclusionary term. It is helpful for a core to conceptualize itself as such not to exclude, but to consciously facilitate the participation of masses of people who do not have the time, energy or desire to be part of a core, but who do want to do something. The antiwar movement’s success rests in harnessing that collective something. Each of the three essays that follow explores one of the above-suggested primary roles of an antiwar core. The aim of this series is to offer analytical tools to increase the effectiveness of an antiwar core. We believe that this core needs a concrete strategy to build a progressive political force strong enough to first end the Iraq War, and then to change the direction of US foreign policy so that it reflects common values of justice, peace, freedom and dignity, thereby preventing future wars of aggression. While this series does not hash out such a strategy, we hope that it may contribute to forging one. While the series touches on objective conditions in Iraq, in the US power establishment, and in US society, it delves deeper into subjective conditions in current antiwar work, with an emphasis on potentials. The authors are active antiwar organizers, and this series is intended primarily for others who are organizing in their areas to end the war. We do, however, hope that at least some of the ideas may be relevant to anyone who hopes for a more just and peaceful world, whether or not they have as of yet found a satisfactory way to act on this hope. We wish to challenge the notion that people who are not presently active in antiwar activities do not care, and furthermore, that the workings of the antiwar movement are irrelevant to such persons. Throughout this series we aim to challenge a dominant story in which civic engagement is a marginal niche identity, or a passing phase for the young or naive, instead of a common responsibility and a public good. For this reason in most cases we replace the label activist – often used to effectively inoculate society against grassroots efforts – with change agent; which we define as anyone who consciously joins with others to intervene in the historical process. Our discussion of the current antiwar movement, including its shortcomings and negative tendencies, is rooted in a love and respect for fellow movement participants, and comes from the conviction that mass movement is the only likely vehicle by which we will positively change the direction of US policy. We believe that the reasons why many people are not presently active in this movement should inform the work of those who are. We seek more strategic dialogue within the antiwar core and beyond it. We hope this series might serve as a small contribution to such dialogue, and that the dialogue might in turn contribute to a broader ownership of a stronger and more strategic antiwar movement.